Spend less time making food or drinks and more time entertaining guests in your outdoor living area. 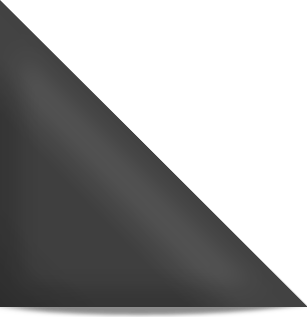 These techniques are often used in bars and restaurants for lightning-fast preparation. Break up at least one full bulb of raw garlic. I usually place it onto a hard surface, and slam it with the palm of my hand to separate the cloves. 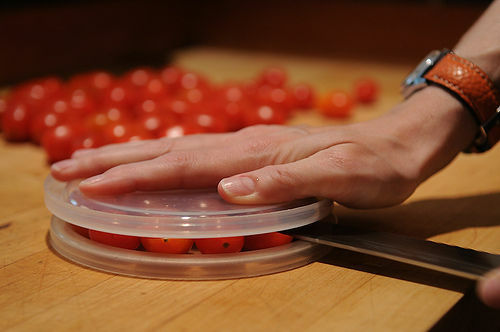 Place the separated cloves into a large stainless steel bowl or a cocktail shaker. Shake as hard as possible. With a little bit of practice, the process should take about 10 seconds. 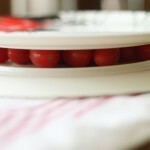 Click here for a video detailing this technique using two large bowls. Click here for a video detailing this technique using a cocktail shaker. 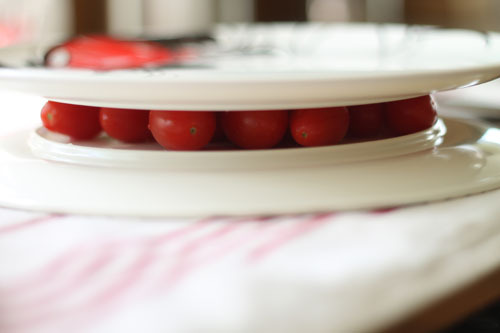 Place a plate onto your counter upside-down. 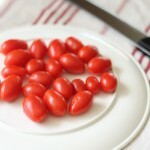 Place whole, washed cherry tomatoes onto the plate. Make sure they’re on a single layer, as opposed to stacking upon one another forming a pile. 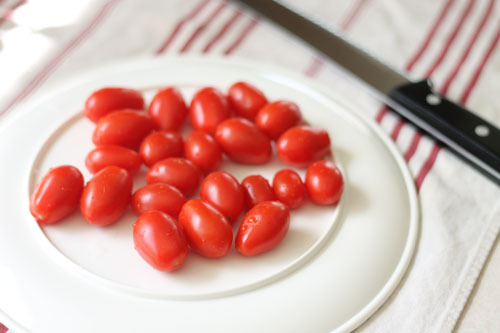 Place another similarly-sized plate on top of the cherry tomatoes with the underside touching the top of the tomatoes to hold them in place as you slide your knife through the horizontal opening. For lemons or limes used as a garnish for drinks, begin by cutting the ends off of the lemon so it can sit flat on your cutting board. Then sit the lemon flat onto your cutting board and cut the lemon in half vertically from top to bottom. Each half should have a line of pith in the center. Score the lemon along this line of pith. This will allow the lemon to easily slide onto the rim of a glass. Now set each half of the lemon flat onto the cutting board with the peel-side upwards, and slice the lemon into as many pieces as desired. Click here to watch this technique in action. Similar to making ice cream, a bucket or tub containing ice, water, and a handful of salt can be used to quickly chill drinks for your guests. Allowing the drinks to be submerged in the solution undisturbed is fine, but to chill a large tub of drinks even faster you can agitate the entire tub with a large wooden spoon or paddle. Using this method, even bottles of champagne, vinho verde, or other white wine can be chilled in as little as 5 minutes. If ice, salt, or a container to place all the drinks into isn’t available, you can instead wrap your drink with a wet paper towel and place it in the freezer. This will take longer than the previous method, but it is slightly faster than simply placing drinks in the freezer. If you’ve ever eaten a fresh pomegranate, you know how messy and difficult they are to eat. This technique is quick, and with a little practice it is relatively mess-free. Use a sharp knife to cut the pomegranate in half. Grab one half, and hold it flat-side down over a bowl. Now smack the back repeatedly with a wooden spoon until all of the arils (pomegranate seeds) have fallen into the bowl. Then repeat with the other half. This is how it’s done at juice bars throughout India.